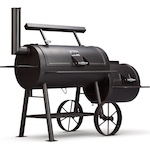 Yoder Smokers Community Forum • View topic - So what does everyone like to do besides smoking? So what does everyone like to do besides smoking? Just thought I would check to see what other hobbies we have. I like to do target shooting and obstical racing. Currently I am down due to a shoulder injury. I had surgery on Oct 30th. So unfortunately it has cut into my smoking and everything else lol. I am going to do a turkey for Thanksgiving, but the wife will have to load it into the cooker for me haha. Re: So what does everyone like to do besides smoking? Playing with my kids, I enjoy listing to music and watching movies, shooting guns, photography, video games, golf (or something slightly resembling golf anyway) and grilling. I need a lesson in that. Wife always catches me on the way out the door. Mike18 wrote: I fly R/C airplanes. What kind of planes to you fly? Always wanted to do that. You shouldn't get me started...this could go on for a long time. If you have any questions about getting started I would be glad to help. I like this GUY, I use to fly a Kadet LT-40 as a starter! Then got in to boats and cars and choppers TOO MUCH MONEY! Work and home stuff, used to golf a lot, mebbe I'll pick it up again. 3 years to go before I can retire. Great wife, kids outta the house and doing well. I'm a full time Pastry Chef here in the Houston area. Also a classical pianist.